Ready for an adventure? Let's get started. Today we have a new exciting game where we meet three adventurers who are on a hunt for the gold of the gods. They are on a quest to explore mysterious jungle ruins full of ancient artifacts and buried relics. But prepare to help them in their quest, because it takes more than luck to claim the Mayan gold! Noah, Emily, and Zoey reach the ruins of an ancient Mayan temple after a long perilous journey in an expansive natural diversity. It is one of the oldest Mayan archeological sites - dating back to 300 BC. They possess a rare sense in finding and recovering gold and have some wonderful stories. So, they start to feel the magic as they walk through the ruins. Noah, Emily, and Zoey know that treasure awaits behind these walls and they start investigating the ruins of the temple. Do you dare to enter? Do you dare to gather as much gold as possible? Only the brave do. 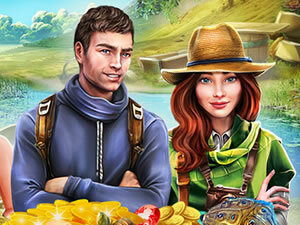 Submerse yourself in the rich Mayan culture and help them find all the hidden objects.